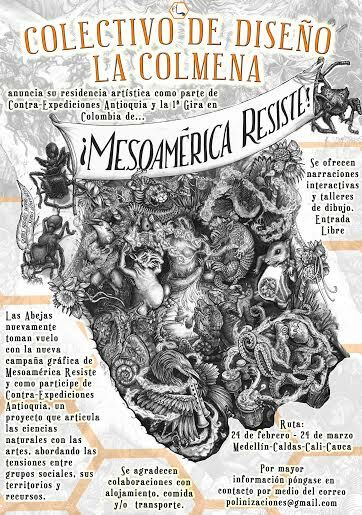 After nine years of research and illustration, the Beehive Design Collective launched their latest graphic campaign, Mesoamérica Resiste, in December of last year. Mesoamérica Resiste is the third installment in a trilogy about globalization in the Americas (following earlier graphics about the FTAA and Plan Colombia). This graphic campaign was directly researched with communities from Mexico, Central America, and Colombia who are impacted by the Mesoamerican Integration and Development Project, a neoliberal regional development plan formerly known as Plan Puebla Panama. After nine years of research and illustration, the Beehive Design Collective launched their latest graphic campaign, Mesoamérica Resiste, in December of last year. Mesoamérica Resiste is the third installment in a trilogy about globalization in the Americas (following earlier graphics about the FTAA and Plan Colombia). This graphic campaign was directly researched with communities from Mexico, Central America, and Colombia who are impacted by the Mesoamerican Integration and Development Project, a neoliberal regional development plan formerly known as Plan Puebla Panama. 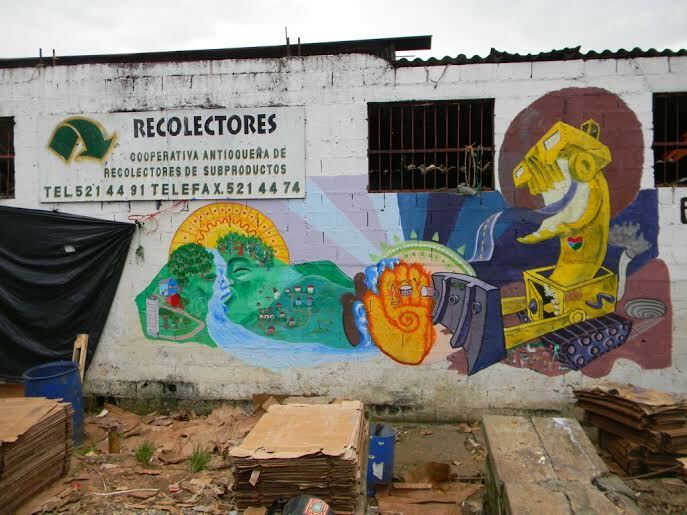 Since fundraising for a big initial print run of posters and banners last year, the Bees have been actively buzzing across the hemisphere using these illustrated popular education tools to pollinate resistance in communities facing resource-extraction industries, militarization, and forced displacement. 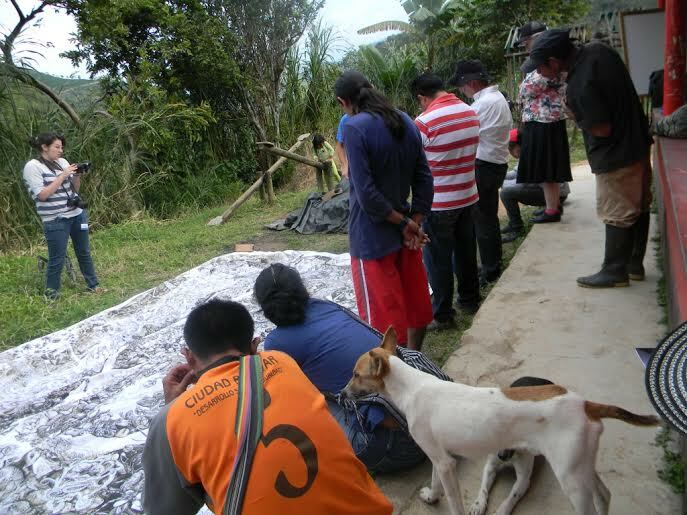 Since late last year, pollinators involved with the project Polinizaciones have been facilitating workshops of Mesoamérica Resiste and sharing posters with communities from Petén, Guatemala to Caquetá, Colombia. 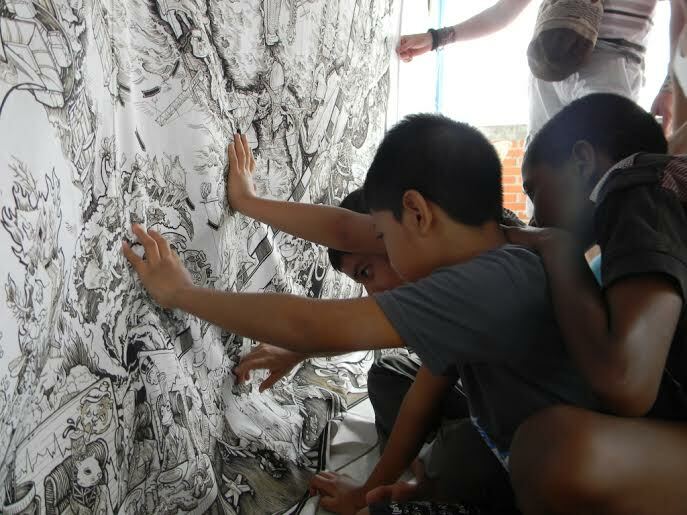 In February 2014, the Beehive was invited to participate in an artist residency with the Museo de Antioquia of Medellin, Colombia, as part of Contraexpediciones (Counter Expeditions). 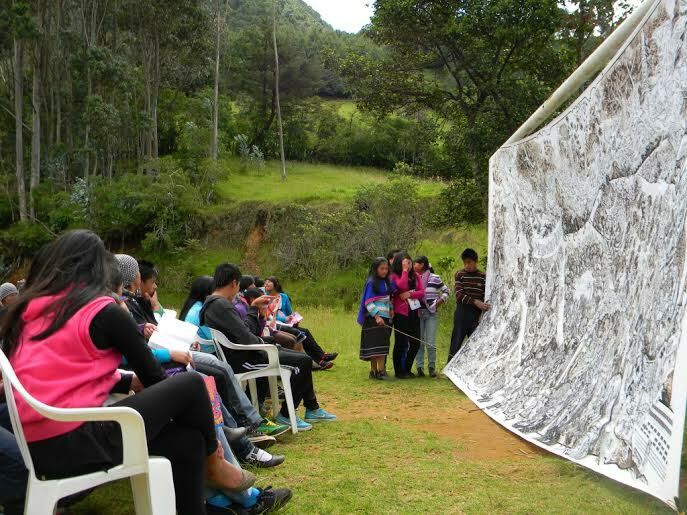 The residencies invited 16 artists and collectives to work with communities in the Department of Antioquia to create artistic pieces regarding territory, identity, and the conflicts that are many times present. 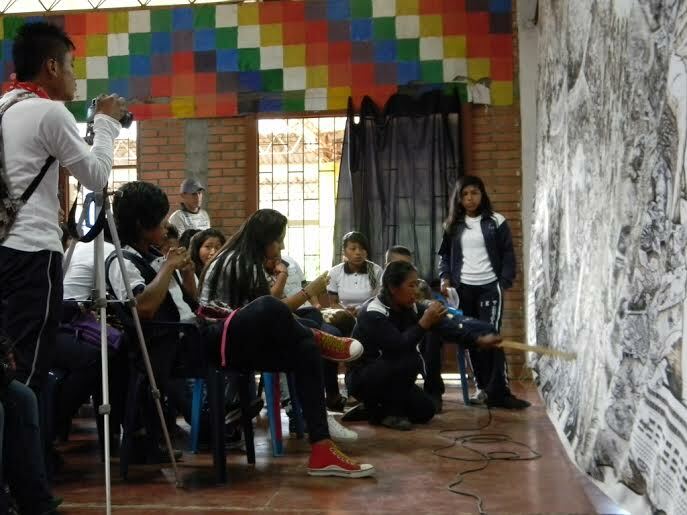 Polinizaciones, along with muralist Guache Street Art, adapted the Beehive’s research methods of creating graphic campaigns to create numerous murals against gold mining in Farallones, Ciudad Bolivar, in a collective process with students from the local school and community members from an environmental working group. 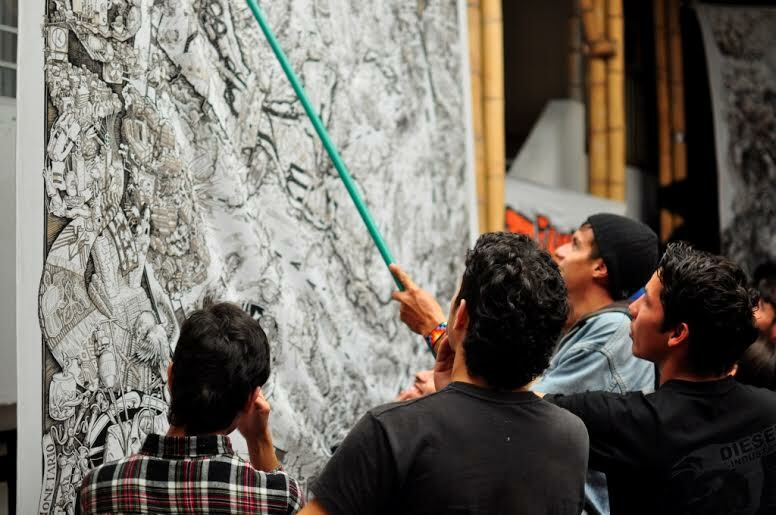 An exhibit of photos documenting this process is now on display at the Museo de Antioquia until June, as part of Contraexpediciones. 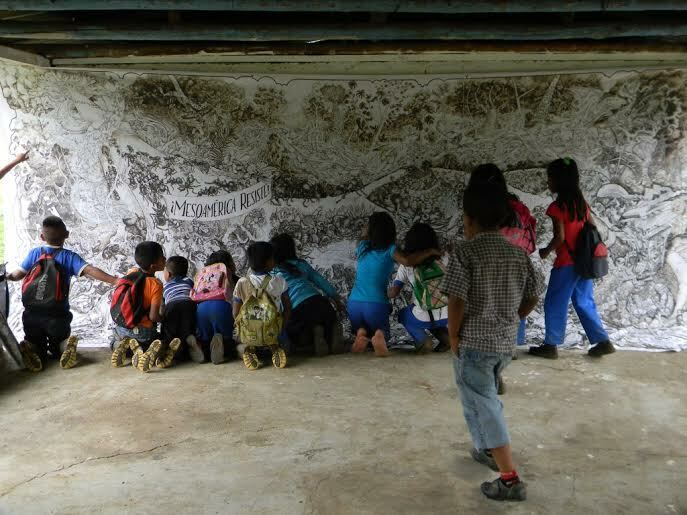 Following the artist residency, the pollinators of Polinizaciones toured and brought Mesoamérica Resiste to a variety of rural and urban communities living the realities depicted in the graphic. 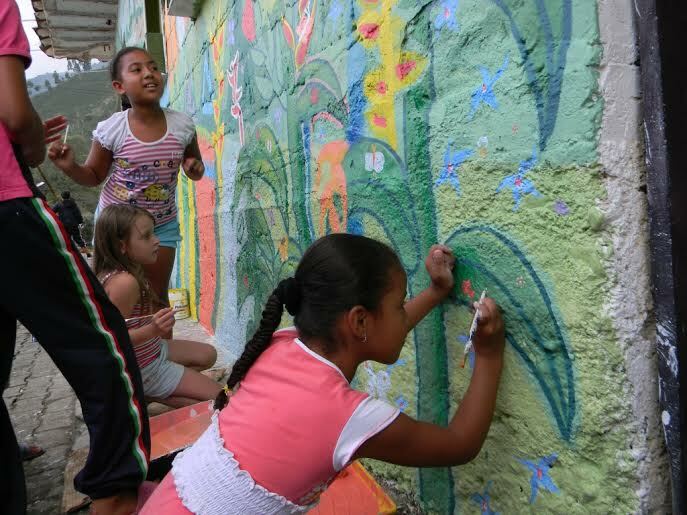 In Medellin, weeks before the city hosted the World Urban Forum,we painted murals and shared with communities suffering the impacts of gentrification. 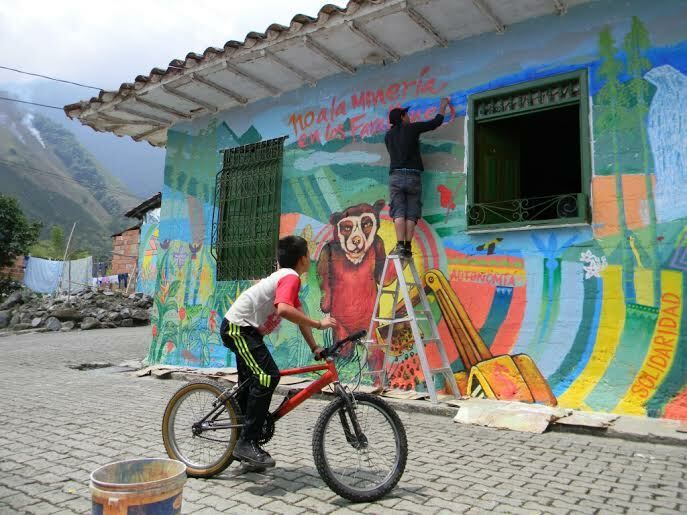 In the Department of Caldas there was a showing in the city of Manizales, and we also spent a week visiting different schools and community spaces in the Indigenous Reserve of San Lorenzo of the Embera Chamí People. 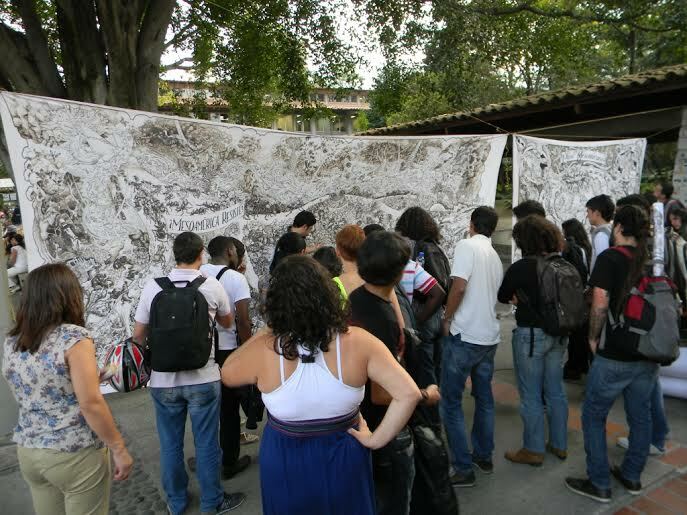 In the city of Cali, Bees presented the Mesoamérica Resiste graphic in different public settings including the University of Valle and the San Antonio hill. 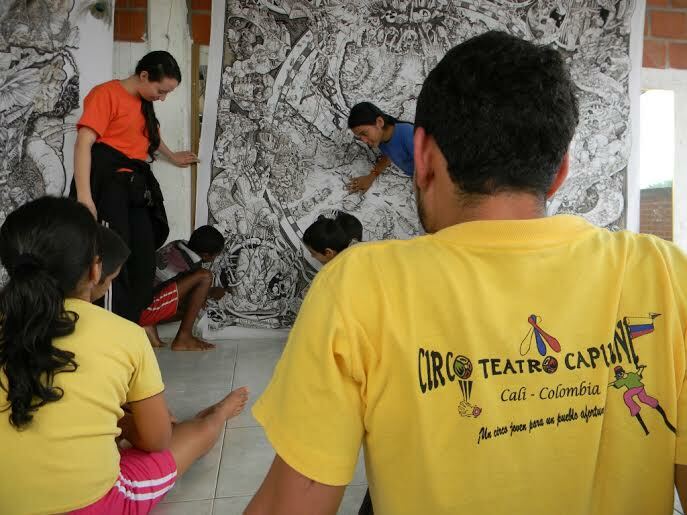 In the Agua Blanca District of the city, a workshop was held with the youth of the Theatre Circus Capuchini. 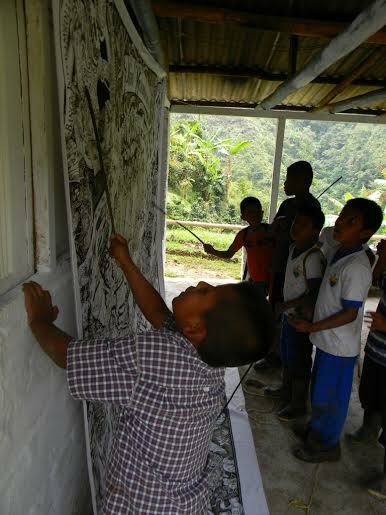 In the north of the Department of Cauca, pollinators visited the indigenous Nasa communities of Toribio and Tacueyo. 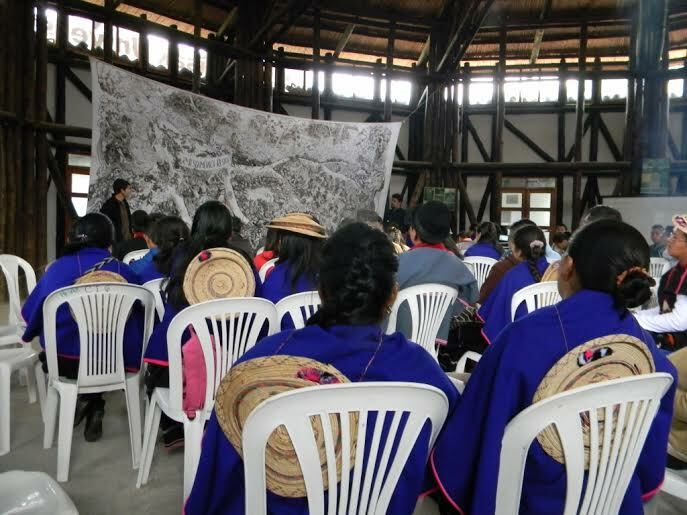 In Tacueyo, the Bees were present for the swearing in of this year´s Student Indigenous Guard and in Toribio, at the CECIDIC educational center, numerous workshops were done with students. 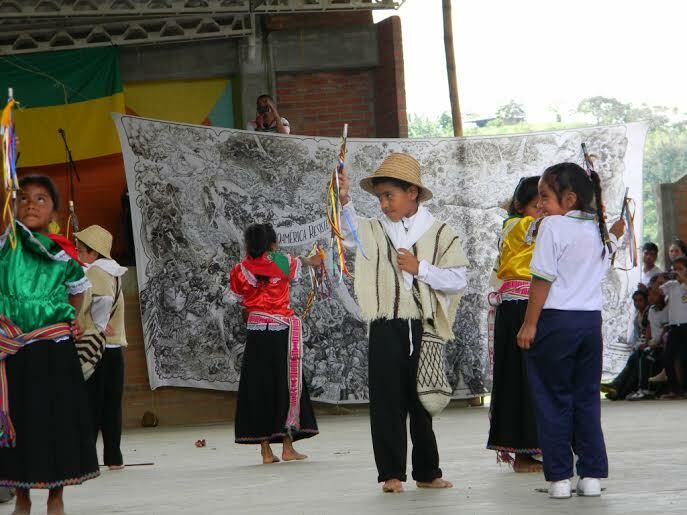 In the area of Silvia in Central Cauca, Mesoamérica Resiste was shared in schools of the Kiswo People and Misak People, as well as at the Misak University and community radio station. 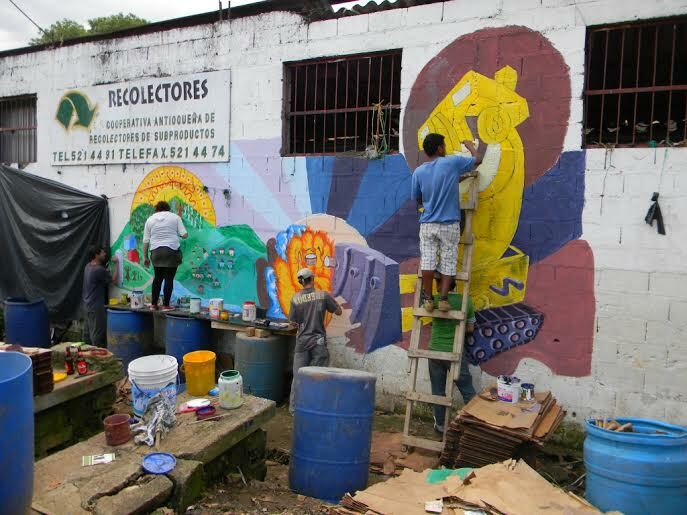 In Cauca, our last stop was the city of Popayan, where Mesoamérica Resiste was shared in spaces such as the Colectivo Cultural Wiphala, the local SENA, and the University of Cauca. The tour finished in La Jagua, Huila, a community impacted by the Quimbo Hydroelectric Project. 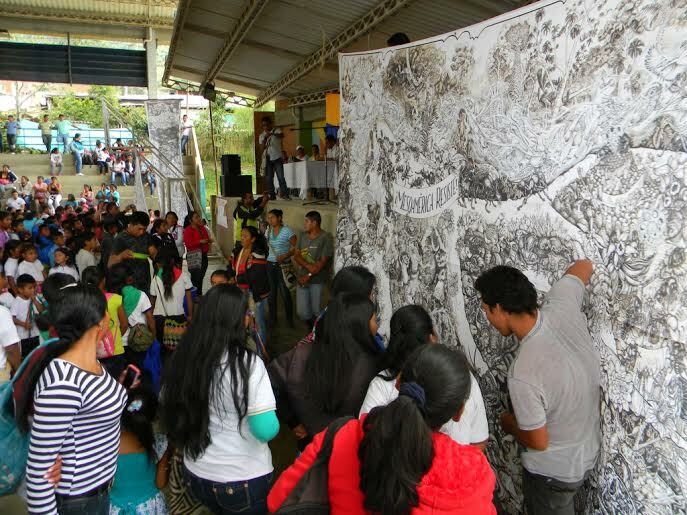 The two-day event in La Jagua included a showing of all four major graphic campaigns of the Beehive, plus a presentation of Mesoamérica Resiste and a drawing workshop the following day. 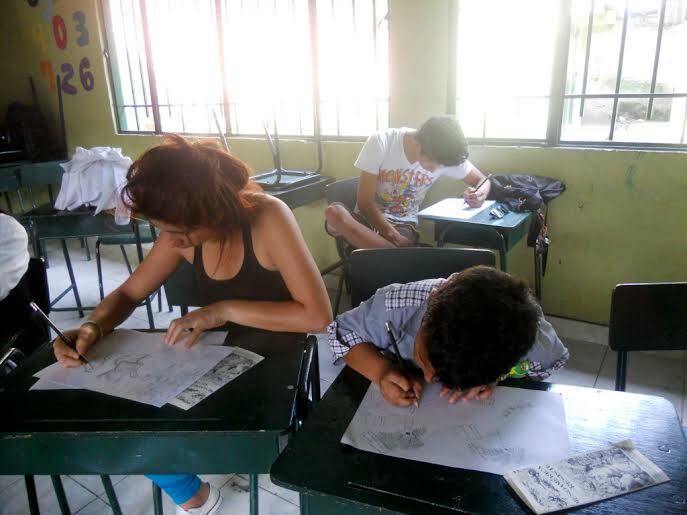 While this tour has ended, the work of sharing the Mesoamérica Resiste graphic and cross-pollinating stories with communities all over the hemisphere continues.